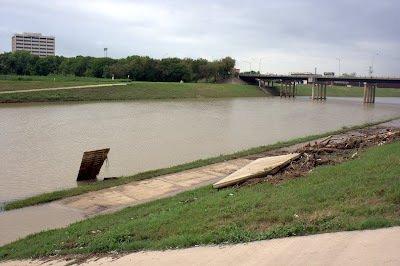 Low water crossing at Beach St.; damaged FW Rowing Club dock. 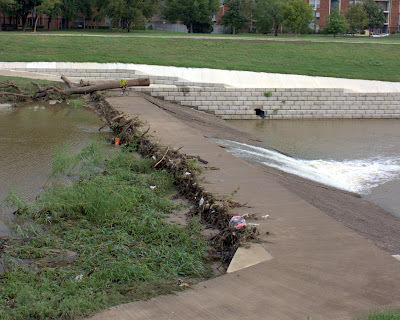 Low water crossing at Beach St. (Gateway Park); much debris and thick mud. 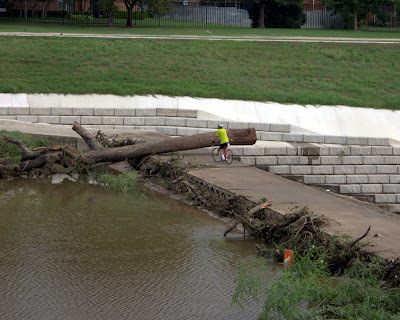 There is a large tree blocking the low water crossing at Bellaire Drive and Southwest Blvd (Hwy. 183) that makes the trail all but impassable. As you can see in the photo it would be possible to carry a bike over the tree, but not easy. Runners/walkers might also want to avoid climbing over this large tree. Tree over low water crossing at Bellaire Dr. & Southwest Blvd. 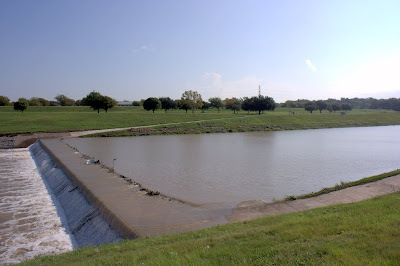 (Hwy 183). 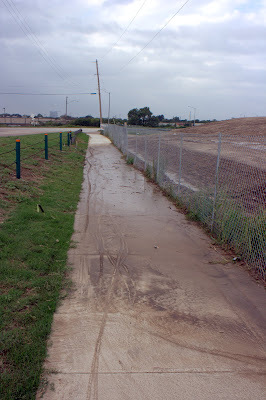 The trail detour near Northside Drive is very muddy in one area (as shown in a photo below) and completely covered by a large puddle in another, undoubtedly with mud underneath (not shown). 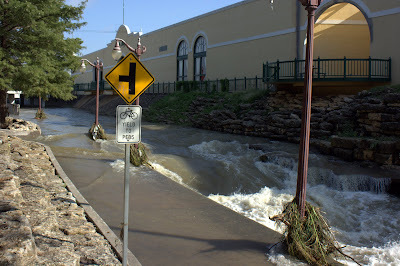 The trail along Marine Creek, through the Stockyards was completely under water this morning and, judging from past storms, there will be significant mud and debris that will make the Trail impassable until it is cleaned up. Low areas farther up the Marine Creek section of the Trail have probably suffered a similar fate. 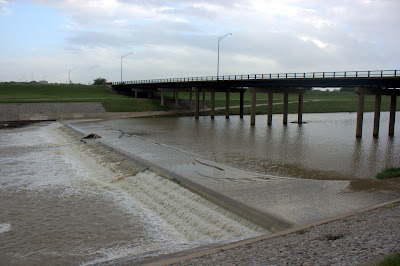 Trail along Marine Creek; Fort Worth Stockyards. 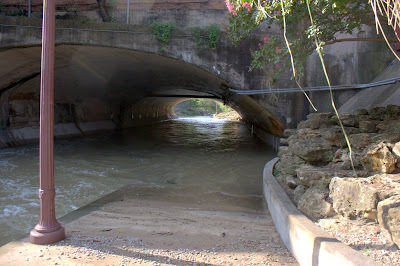 Mud & water covered trail under Exchange St., Fort Worth Stockyards. 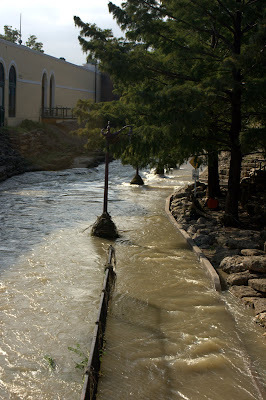 Trail underwater along Marine Creek, Fort Worth Stockyards. 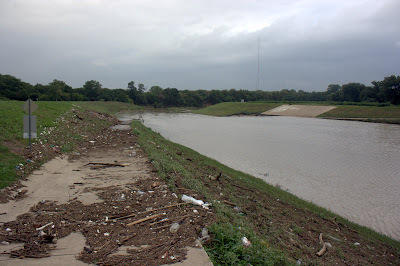 The low water crossings by La Grave Field (first photo below) and the 4th St. Bridge (second photo below) were still underwater, but did not have any debris blocking the path or significant mud on the ramps; so they might be passable soon. The amount of mud on areas still underwater remains to be seen. Low water crossing near La Grave Field. Low water crossing at 4th St. bridge.